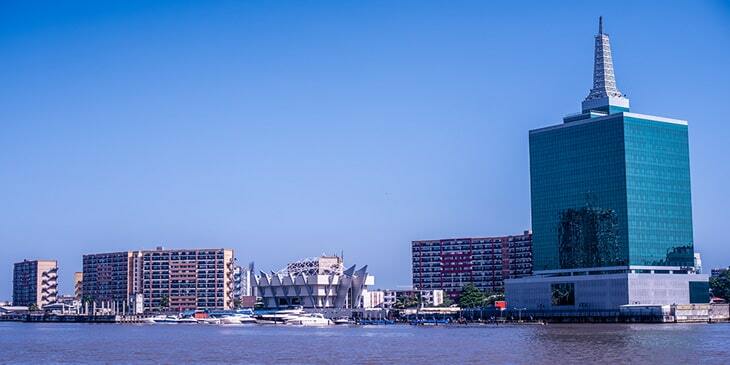 Lagos is one of the largest cities in Nigeria which boasts lots of scenic settings, from breathtaking nature reserves to shimmering coastlines and wildlife rich lagoons. This mega city of West Africa is world-renowned for its commercial skyscrapers, beach resorts, colonial-era monuments and vibrant cultural venues. You can experience lots of activities here; go horseback riding at Coconut Beach, golfing at the Ikoyi Golf Club, surfing at Halemson Beach, scuba diving at Victoria Island, jet skiing at Tarkwa Bay Beach and canoeing, snorkelling and deep sea fishing at La Campagne Tropicana Beach. Lagos is also home to lots of historic landmarks; the most prominent amongst them is the grand Iga Odungaran Palace, the residence of Lagos’s ruler Oba Rilwan Akiolu. You can also visit the Cathedral Church of Christ, the first Anglican Cathedral in Nigeria designed by Nigerian architect Bagan Benjamin. Another must-see icon of the city is the Lagos Central Mosque, constructed in 1841 featuring a metallic central dome and magnificent minarets. Book Lagos flights from India with Brightsun Travel and look forward to lots of exploration and sightseeing in this memorable city. Being a distinctive destination of arts and culture, Lagos offers plenty of opportunities to explore Nigeria’s best museums and art galleries. Visit the National Museum to discover a wide range of royal crowns, brass sculptures, ivory carvings and clay animals dating back to 200 AD. There are also unique historical items displayed here, including clay pots and unusual dance costumes worn during royal funerals. Another intriguing museum in Lagos is the Badagry Black Heritage Museum; there are thousands of artifacts displayed here, including various sketches, shackles, photos, sculptures and historical documents related to Lagos’s history. Then there’s the Kalakuta Republic Museum which is situated in the former home of established musician Fela Kuti; here you can discover the Nigerian multi-instrumentalist’s personal articles, including costumes and musical instruments. You can also visit the Nike Art Gallery to browse more than 7,000 exhibits and paintings created by renowned artist Nike Davies-Okundaye. Contact Brightsun Travel to book cheap air tickets to Lagos from India and explore the world-class museums and art galleries of this city.